More than 20 years after North and South America eliminated the threat of polio, sub-Saharan Africa is finally on the brink of being declared polio-free. Last month the region marked one year without a new polio case following the last case in Nigeria on 24 July 2014. If no new cases are reported for another three years, Africa will be certified polio-free by late 2018. Polio has maimed and killed hundreds of thousands of people across the globe. Polio paralysis has caused physical suffering, life-long dependency, loss of productivity and placed a heavy burden on poor families. As a result of the use of two vaccines developed more than 50 years ago the annual number of polio cases has globally dropped by more than 99% from about half a million in the 1980s to only 34 so far in 2015. But eliminating the last 1% of cases of polio is still proving to be a challenge. Currently, only parts of two countries in the world remain polio-endemic – Pakistan and Afghanistan. Polio is a communicable disease caused by one of three related wild polioviruses: poliovirus types 1, 2 and 3. It attacks at any age but mainly affects children under five. The virus typically enters the body through the mouth and multiplies inside the gut. Initially it manifests as flu-like symptoms. Once established, it enters the bloodstream and attacks the central nervous system. As it proliferates, it destroys nerve cells which stimulate muscles. These nerve cells cannot be renewed and affected muscles no longer function. The virus circulates silently at first, possibly infecting up to 200 people before the first case of paralysis surfaces. Immunity against polio comes from either natural infection, which is when one recovers from polio or is immuned against contracting the disease through vaccination. There are two polio vaccines which are highly effective. The first is an injectable vaccine developed in the 1950s, the second an oral vaccine developed in the 1960s. Of the three poliovirus types, type 2 was successfully eradicated in 1999 and worldwide cases of the other types are down to the lowest levels ever. In 1988 the World Health Assembly, which governs the World Health Organisation, adopted the Global Polio Eradication Initiative. The strategy was developed as a result of the success in eradicating smallpox in the 1970s, because of the similarities in the spread of the viruses. Like smallpox, polio only attacks humans. Polio viruses also only survive for a very short time in the environment and there are no animal or insect reservoirs that carry them. Similar to smallpox, polio can be eradicated and an effective vaccine is available. Once a person is immunised against it, immunity is life-long. The polio strategy included widespread routine vaccinations, mass vaccination campaigns and a rapid response to polio cases. But the most critical element of the strategy is surveillance – in the community and the laboratory – to find polio cases that may have been ignored or initially overlooked. Surveillance in the community needs to involve both the general public and health care workers. Health care workers need to report all cases where children experience abrupt weakness in the limbs, even if the weakness is presumed to be triggered by an injection. Community leaders need to report any newly paralysed children in their communities to health care services. In the laboratory, the specific polio virus is identified and its source determined. Without this high-quality surveillance it would be difficult to locate where and exactly how the poliovirus is circulating or to confirm when its transmission has been stopped. Countries are certified to have eradicated polio only if no cases of the wild poliovirus are reported for three successive years. There must be documented evidence from high-quality surveillance which shows this. 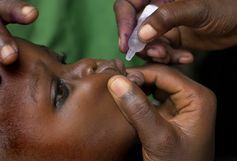 A child receives an oral polio vaccination. Currently, four fifths of the world’s population live in regions certified to be polio-free. In 1994, the Americas were certified polio-free, followed by the Western Pacific region in 2000. Europe received its certification in June 2002 and the South-East Asian region in March 2014. In 1996 African heads of state resolved to stamp polio out of Africa. Then South African President Nelson Mandela launched the three-year “Kick Polio out of Africa” campaign. But by 2000, wild poliovirus was still circulating in Egypt, Niger, and Nigeria. The situation worsened when the polio vaccination was stopped in northern Nigeria for religious reasons. As a result, polio transmission spread from the area to eight other African countries in 2003. Poliovirus continued to circulate in Africa until last year. But the number of affected countries has steadily been decreasing. In 2004 there were 14 countries that had polio outbreaks. These included Benin, Botswana, Burkina Faso, Cameroon, Central African Republic, Chad, Côte d’Ivoire, Egypt, Ethiopia, Guinea, Mali, Niger, Nigeria, and Sudan. In 2011, this dropped to 12. Last year, there were only five African countries with polio outbreaks: Nigeria, Cameroon, Equatorial Guinea, Ethiopia, and Somalia. In all these outbreaks, the common factor was the country’s failure to immunise. The reasons for this failure varied from one outbreak to another, but in each case there was a group of non-vaccinated people that enabled the poliovirus to seed itself and spread far and wide. The size of the unimmunised population ranged from small isolated groups which refused vaccination for religious or cultural reasons to entire birth cohorts in areas like Somalia experiencing humanitarian emergencies. As long as a single child remains infected, children in all countries are at risk of contracting polio. While the humanitarian benefits of polio eradication in Africa will be immeasurable, efforts have been made to quantify the financial savings that can be anticipated. The World Health Organisation estimates that once polio is eradicated and vaccination halted, global savings from vaccination, treatment costs, and rehabilitation will amount to nearly US$2 billion a year. African countries should start careful polio legacy planning now to ensure that most of that money is redirected to other health programmes. Charles Wiysonge is Professor of Clinical Epidemiology at the Faculty of Medicine and Health Sciences at Stellenbosch University. Previous articleIn a water-scarce West of the future, who will be hit hardest?